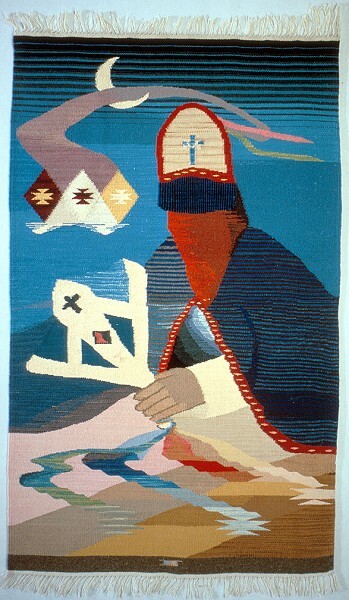 Pictorial weaving, Hispanic, titled Buscando la Malinche, woven by Irvin Trujillo, Chimayó, New Mexico, 1986. On loan from the artist to the National Museum of American History, Smithsonian Institution, cat. no. 1991.6047.01. Dimensions: 54.5 in. (warp) x 34 in. (weft). Fibers: Warp = 2-ply commercial wool yarn. Weft = 4-ply commercial wool yarn. All natural dyes. Design: Pictorial of a Matachine dancer, holding a trident and wearing a headdress with a cross and a fringe that covers his eyes. A red kerchief covers his lower face. He is also wearing a blue, striped cape. The background is predominantly blue and has several motifs including a partial moon and small stepped elements.